Window treatments in conjunction with window film work hand in hand. It’s the perfect combination for comfort, aesthetics, and protection of your investment! Our roller shades are hand-crafted from top-quality materials, easy to use and great for managing light. Roller shades make a great addition to any home decor especially in conjunction with window tinting. We work with everyone from homeowners and interior designers to building companies to suit your decor and building structure layouts. With an array of many different light filtering options, colors, and textures we will have an option that suits your project! You’re going to love the elegance of window shades. No matter your décor style or color scheme, we’ll find the right fit. 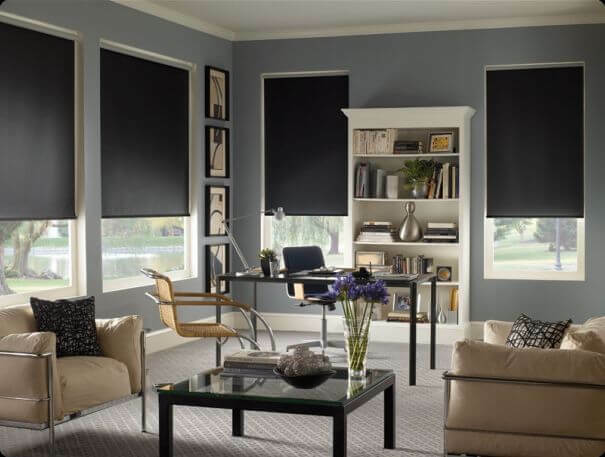 We can order to your specification and install yourself, which you will get professional grade shades at a consumer box price point. Contact us or Call to set up an in-home consultation!